I know it is going to be a lovely day when I find something waiting for me in my mailbox...besides bills. Today was a happy-mail day because I opened it up to find these waiting for me inside! I love seeing those big blue letters staring back at me! First I tore into the big box...I always open the biggest one first, don't you?? I can't wait to see what is inside! Lucky me!...I was the giveaway winner the lovely Tammy of Tinsel & Company was hosting in honor of Valentine's Day! Isn't her wrapping just gorgeous!? 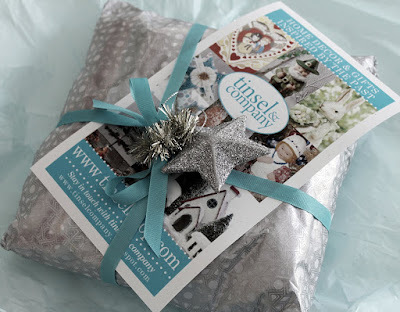 I love knowing I can visit her website...order something for a gift and it will arrive just as beautiful on the outside, as what is on the inside! These are little beauties that were inside all that pretty wrapping...are they just the cutest!? 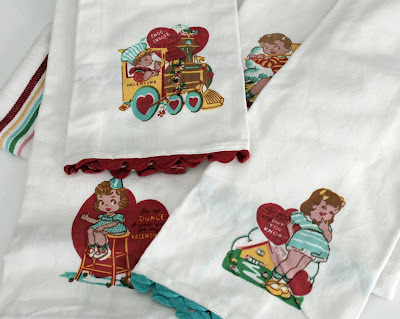 4 of the most adorable vintage-inspired Valentine's towels! Nothing like a little rik-rak and bright, cherry color to liven up a dreary February day! Thank you, Tammy! You really need to check out Tammy's blog...and her website! The new Easter goodies that are coming in look gorgeous! Package #2...well that one held the long-anticipated FLEA MARKET STYLE MAGAZINE! Did you get yours yet? If you didn't pre-order from Heather Bullards blog, it will be in stores on Feb 23rd. I was happy to see so many of the girls I have grown to know and love in blogland featured in the pages. I'm looking forward to reading every single word! 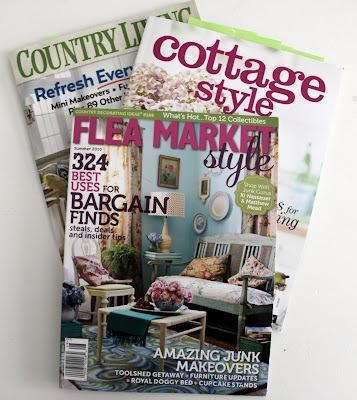 If you are not familiar with who launched the Flea Market mag...visit their blog. You may see some familiar faces! Nothing this girl likes more than curling up in bed and dreaming my way through the latest and greatest in decor magazines. By the way, if you have not yet checked out the new Cottage Style magazine you see peeking out from behind...run...literally...to your closest store and buy one! See all those green post-it notes marking my favorite pages?? Well so many of those pictures have been saved on my computer for soooo long. I was thrilled to find so many in one magazine! Have a great night girls...I'm off to do a little dreaming...one page at a time! Lucky you! 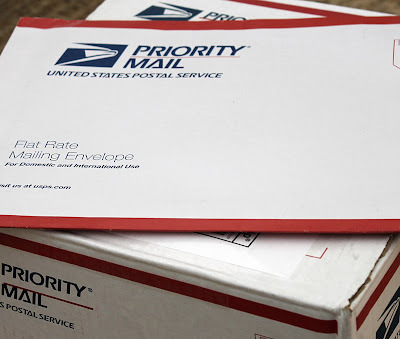 I love that kind of mail. Enjoy! New magazine issues are my favorite. The Flea Market magazine is in stores, isn't it? UPDATE: We have SOLD OUT of our copies of Flea Market Style. We won't be restocking this issue but it will be available on newsstands February 23rd. Most major retailers will carry it such as Barnes & Noble, Borders, Target, Walmart, CVS and Walgreens in addition to others. Thank you very much for your support of our magazine! I don't think there will be too many out, so get to the store right on the 23rd if you want one. It is FABULOUS! Lots of great projects inside! I hadn't heard about Cottage Style...gotta pick me up that one...as well as Flea Market Style. I grabbed the Cottage Style and flipped through it briefly at Target last night. I didn't end up buying it because it seemed that the features were all repeats from past magazines. Maybe I just got unlucky and looked at the "wrong" pages? Woohoo, Mary! You won such cute tea towels!!! I'll be checking out her website fer sure, fer sure...like totally! The cottage style magazine is the best mag. I've gotten in years!!! Oh lucky you!!! Love all those magazine. I have not seen that cottage style yet!! Better run out tomorrow & find it! I can't wait for the Flea Market Style to hit the stores! Only a few more days.....There really is nothing better than curling up with an awesome magazine & dreaming, huh? So fun! Mary- I want to see photos of the inside of your home with all of your treasures! I love getting a sneak peek of people's home that have the same taste as me. Flea Market should be at my hosue soon!! yipee, and I have read cottage Style, love it...I don't get much time to read magazines, but I am making time now!!!! this is an adorable blog. thank you! did I...or didn't I...buy that big ol' cabinet??? can anyone help a girl out?